Brooklyn, New York has many different communities that make up a rich tapestry of cultures and backgrounds. One very individual part of Brooklyn is the Hasidic Jewish community, keeping themselves busy with their religion and home-making they pose to be a very closed part of New York. With that said, I felt the need to observe the goings-on of their Kosher way of life. To be honest I only had a faint idea of where I was meant to be going, but fear not I found my way in the end. Taking the L Subway train to Bedford Avenue, Williamsburg I was lead to be amazed at what I was about to witness. After walking the length and breadth of Williamsburg. One particular street sign became clear to my vision. Lee Avenue, my intended destination had been found finally. Why choose a street so particular as Lee Avenue? I had researched before about Jewish New York and this avenue had looked very interesting on Google Earth, quintessentially Kosher you could say? You might ask why on earth would I want to stray out the confides of Manhattan? I tell you something! I like to push the boundaries and within reason like to see places that aren't advertised in the tourist guides. Hasidic Jewish culture interests me because these people are so devoted to their religion and only trust people within their tight knit community. I feel like I was drawn to this part of Brooklyn, NY for a reason, I just loved the restricted feeling of this neighbourhood for these people put a lot of effort into not mixing with other communities in Brooklyn, let alone the rest of NYC! My paternal ancestors were of the Jewish faith, so you could say that's where my fascination with all things Jewish enters this equation? I don't think my ancestors were a part of the Hasidic way of life but they were Jewish never-the-less. Lee Avenue oozed a feeling of cohesion and togetherness, the shops with their Hebrew signs and the many religious men passing by dressed in their black and white attire, donning their 'payot' which literally translate to 'ringlets'. I had made it to Lee Avenue finally, I was immersed in the centre of the Hasidic Jewish enclave of Williamsburg, well one part of Williamsburg because I don't think its all Jewish in Brooklyn. For what I was about to see would be more realistic than a television show I had previously seen about this part of Brooklyn? I know I saw exactly what I set out to, Williamsburg's Jewish sect impressed me much! There was no McDonald's for me to have some lunch at for everything was strictly Kosher so I just made the best of my current surroundings. I took a breather I discovered 'Frankel's Kosher Supermarket' that had everything a good Hasidic Jewish person could find on their food shopping list. One thing that I saw in 'Frankel's' was that the women took care of the domestic side of things. Were the Jewish people a little work shy? No, I say this because the businesses along Lee Avenue were simple but to me they looked very Jewish from an outsiders point of view. The many Kosher bakeries, clothes shops, Kosher food stores and Kosher Butchers had a very big Jewish presence, more to the Hasidic way of things. Babies, babies and more babies! 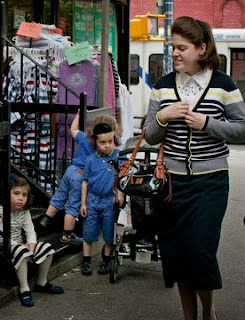 The Hasidic Jewish way of life focuses on families bringing multiple children into their community. Being a check-in agent dealing with large Hasidic Jewish families can be quite testing because there's always at least five children minimum in each family, its all fun and games! So, one thing is sure that the birth rate within the Jewish community in Williamsburg must be sky-rocketing as every woman that I passed by on Lee Avenue had a buggy with a newborn baby, occasionally some of these women had baby and a toddler with them. I say whatever makes these people happy, if it means the more babies the better then that's fine with me! Aside from the growing population the Hasidic Jewish mothers looked very sophisticated with their black cardigans and skirts. Covering their hair to satisfy the Kosher law with either a 'Tichel' which is a 'Headscarf' or either wearing a 'Sheitel' which is a 'Wig'. No conventional high street brands for these ladies as modesty is key, but the Hasidic Jewish way of life obviously doesn't impair the women's fashion sense as I saw there was a number of wig and clothing boutiques, all abiding by Jewish law. Some Jewish surnames can be easily recognisable, four surnames were plastered across shop signs. Surnames like Rosenfield, Schwartz, Schreiber and Stein were seen proudly advertising the Kosher businesses along Lee Avenue. I loved the hardware store called 'Tiv Tov' something like the Jewish answer to the all odd bits and bobs, there's definitely one of those shops on Ferry Street selling the same stuff. As I made my way down Lee Avenue that little bit further I couldn't help notice that English wasn't the first language to be heard, the local Hasidic Jewish people definitely love their Yiddish! To the ear Yiddish sounds quite interesting to listen to! I know that schlepping all the way to Jewish Brooklyn was worth every wrong turn to eventually find the captivating Lee Avenue. This just shows I'm not a schmuck whatsoever! Oh Vey! Everything's So Kosher ! !